I Want You, Not Facebook! This is the second in series of articles about the use and abuse of social media in digital marketing. Today we will look at the practice of Facebook bait-and-switch, and why you should avoid it. A trend we’ve seen recently is to use email to push for social site interactions. An email goes out offering customers a discount coupon, but when the recipients click on the link, they are taken to a Facebook page where they have to login or click “Like” to receive the coupon. Many people use social channels every day and are big fans, but a small percentage resist sharing their lives on social channels and do not want to be associated with a social site. Still others don’t mind using the social channels for personal communications, but refuse to connect to businesses. Sending these people to Facebook, Google+, or other sites will cause many to just ignore your offer and be frustrated that everything must be social. Recipients expect active links in their email; it comes with the territory. What they don’t expect—and don’t like—is to be forced, without warning, to log into Facebook from a link for more information on your products or services. We’ve seen examples where a customer sent out invitations to a party event via email, but made the links go to a Facebook page. In some ways this is great marketing – as people confirmed they would be attending other people could see the growing list of attendees, and those that wanted to could comment. The problem was that not everyone wants to be sharing everything on Facebook, so many of the comments were angry customers asking why they had to use Facebook. Who knows how many non-Facebook users never even got that far. The company quickly backpedaled and provided a web page on their company site for people to go to (the link destination was changed on the fly, so recipients who were slower to click never saw the Facebook page). A Facebook “Like” button in your email is still the best way to draw people to your Facebook page (ditto for Twitter, LinkedIn and Google+). 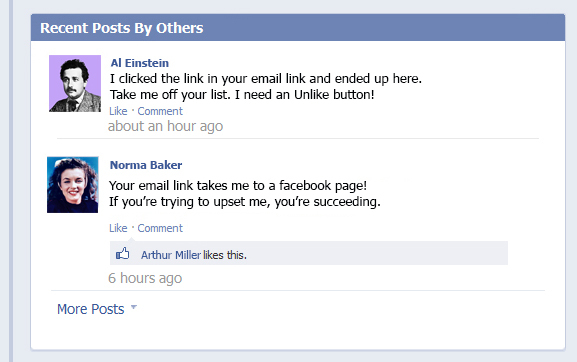 If customers like what they read in the email, they can prove it by adding you to their Facebook list. From there it’s fine to reiterate the offer in the email and give them the opportunity to share it across their networks. Just remember that you’re still going to want them to get back to your website at some point. This eliminates the privacy concerns (both founded and unfounded), and, more importantly, it puts the analytic information back in your bailiwick instead of sharing it with Mark Zuckerberg. This also holds true for any ads that you’ve placed on Facebook. Link them back your site. Never forget that, regardless of Facebook’s marketing potential, people first and foremost consider it a place to contact friends, and not a place to listen to sales pitches. This entry was posted in CRM, Deliverability, Email marketing, Social Media and tagged Facebook, Like button, Mark Zuckerberg, Symphonie, tools on October 11, 2012 by Jim Morton. This is the first of a two-part series on social media and digital marketing. In this series, we’ll look at the advantages and disadvantages of using social media, and how to ensure your social media efforts don’t interfere with your email marketing efforts. Every day, it seems, a new channel pops up for marketers to use to get their messages out to the public. Many now use Facebook, Twitter, and YouTube (when video is applicable) to promote their products and services. Other sites such as Pinterest, Google+, and Foursquare are also gaining traction. Too often, though, marketers treat these various channels like baseball cards, trying convince the public to “collect ’em all.” To achieve this, marketers will use a teaser process to get people to connect to them on every channel. An email with a link to a coupon takes the recipient to the company’s Facebook page, where the person has to click the “Like” button to receive the coupon, and on the Facebook page, there is an announcement that you’ll have to follow them on Twitter to get special daily discounts. There are, no doubt, a few people who enjoy this sort of scavenger hunt, but most people find it annoying. “Why can’t you just give me the coupon?” They wonder. The end result is frustration for the recipient and the potential to lose a customer you have worked hard to get. If they get a communication that says they should now sign up for a different channel to get what was offered in the first email, many people will feel frustrated, wondering why their chosen channel isn’t good enough. 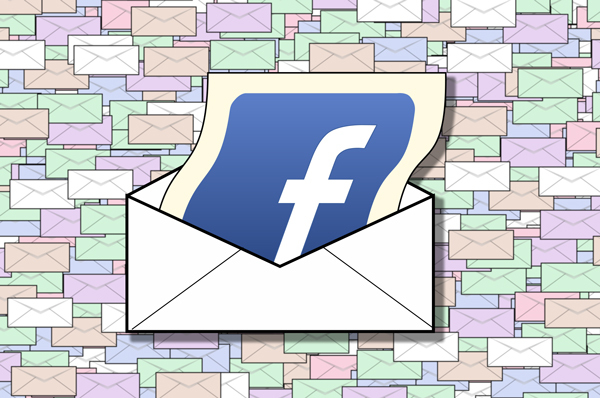 In our experience, emails sent to customers telling them to sign up on Facebook can lead to poor deliverability. They have higher complaint and unsubscribe rates, which leads the ISPs to direct more of your email to the junk folder. We’ve seen such a significant hit on deliverability that it can take several more engaging emails before the deliverability rates recover. The customer that does sign up for all your social channels can also turn out to be more of a burden than a boon. If you are sending the same message in several channels, recipients may read the message in one channel, and not bother to look at it in the other channels. 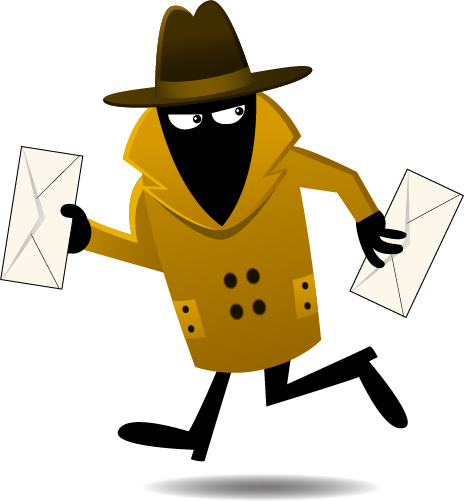 In the case of email, this means an email may get deleted without being opened, which the ISPs take as a sign that the recipient is not interested in receiving that email. If this continues long enough, the ISPs will take notice and start sending any new email from you directly to the junk folder. Additionally, many people will feel exhausted if the same message is delivered multiple times. Research indicates that most recipients don’t want frequent emails with the same basic content, but what if that message is magnified multiple times when the persons gets the email, but also one or more social sites, plus Twitter or other direct SMS? Clearly this will lead people to start tuning out on your message. Different users like to be communicated with in different ways. Some people love social sites and don’t use email as much anymore. Others resist social sites and prefer the one-to-one communications of email. Whenever possible it is better to let the customers decide which channels works best for them. Communicate with people in the way they request, and don’t coerce them into changing channels or signing up for multiple channels. Part Two: I Want You, Not Facebook! This entry was posted in Deliverability, Email marketing, Social Media and tagged Facebook, Foursquare, Google+, Pinterest, Twitter on October 4, 2012 by Jim Morton.